business and in life, were planning in February. Burlini was quietly working hard creating new paintings deliberately hidden from all until the unveiling of the show. He gave us tickets that only added to the feeling of the unexpected. The tickets reminded me of Willy Wonka, and his golden tickets. What fun! What would they bring to the recipients? ​When the evening finally arrived, I went with my husband Larry, my fellow student Steve and his grandson Ty. We piled into the car to be the first ones there. Steve and I were very excited to see the exhibit of our instructor. When we arrived, police officers were efficiently helping direct cars to parking spaces. That was impressive, and we began to understand what Burlini was intimating for months. I didn’t’ know what to expect, but I didn’t expect to see and hear what we encountered when we exited the car. The first things I noticed were giant images of Burlini’s older works being projected on a wall accompanied by trendy music. other beverages were available at another table where early arrivals were beginning to congregate. refreshments, and listening to this very talented musician. He performed music from the likes of Sting and the Gypsy Kings, and this added to the sense of fun and adventure. ​I should have known that every activity that my group and I experienced when we first arrived was only a prelude to the art. As we approached the studio, I knew right away things were going to be very different inside. A red carpet led us to the front door, and there was a doorman! Of course, I realized later that a doorman was essential to control the crowd entering the studio. As we entered the building I stopped short. Here was the place that I painted once a week for the last two years, and I didn’t recognize where I was. We were in a small alcove that opened up a few yards further. Where was the office? Where was my painting spot? Where was Steve’s spot? I quickly forgot my disorientation when I realized the vast difference between the carnival atmosphere outside and this new one. The music was ethereal, giving me a sense of serenity; it was almost Zen like. And, the artwork took center stage. Burlini’s latest series had a beach theme, but please don’t imagine simply sand, oceans and flamingos. Absolutely not. I don’t know if Burlini would like me to pigeonhole him, but I must, just to make the reader understand how unique his work is. He is a pop surrealist. His works clearly reflect his personality. His paintings are mature with a touch of rebellion and impishness to make each painting extraordinarily interesting and entertaining. I don’t claim to be an art critic, but I was blown away by the collection: I felt the waves were going to break right over my head, and I was enthralled by the elongated, bikini-clad beach goers. And the colors! As an amateur painter, I struggle with color. Burlini is a master. The second room had some of Burlini’s older works: the robots, scenes from his native Chicago, motor scooters and a pinball machine (my husband’s favorite). All of them reflected Burlini’s incredible talent, quirkiness and sense of humor. Burlini told Steve and me during our first class that along the way, he discovered the true meaning of art and creativity; it was freedom. All of his paintings reflect that feeling of freedom of expression. It is something that, as an art student, I am just learning. With his help, I will get there. When we exited, the crowd had doubled, and there was now a line to enter the studio. The doorman was working even harder to control the numbers inside. Over a glass of wine, we discussed the new collection with fellow students we met as we negotiated the crowd. Everyone with whom I spoke was awed by the whole evening. It was more than the unveiling of a new and exciting art collection. It was a happening, a treat for the whole family. Each activity prepared the participant to go further, and every activity was a “lead up” to the art. Burlini is already hinting at another exhibit in the near future. I cannot imagine what experiences he will plan for the next one. No matter what, I will be there!!!! Artists become known for their particular styles, but events in an artist’s life can lead to major changes in artistic expression. That is the case with painter Christopher Burlini. Burlini, trained by Italian masters, paints and teaches at the Burlini Studio of the Arts in Boca Raton, Florida. His recent collection, "Moments in Time," exemplifies such a change. Burlini's new style reflects an end to earlier struggles and a turn to the wonder and peace in his present life, the result of his moves from Chicago, San Francisco and Miami Beach, and the opening of his own studio that he runs successfully with his partner Belinda. "Artists paint where they are and how they're feeling, and the last 10 years have changed my life", he said. "It's gotten better." His paintings now are very different from those of the past. "It's a complete 180 from the heavy innuendos and darker explorations in my earlier work," he said. I'm communicating with my audience through happiness and fun now." The immediate catalyst for change was very personal. Gorda - Spanish for chubby - a beloved rescue dog and constant companion for years, passed away while he was completing a painting. It seemed like a sign. "I took her everywhere, and she'd always been beside me while I worked," he said. "I thought, if I'm going to make a change, now is the time. Sometimes you have to walk through a new door." 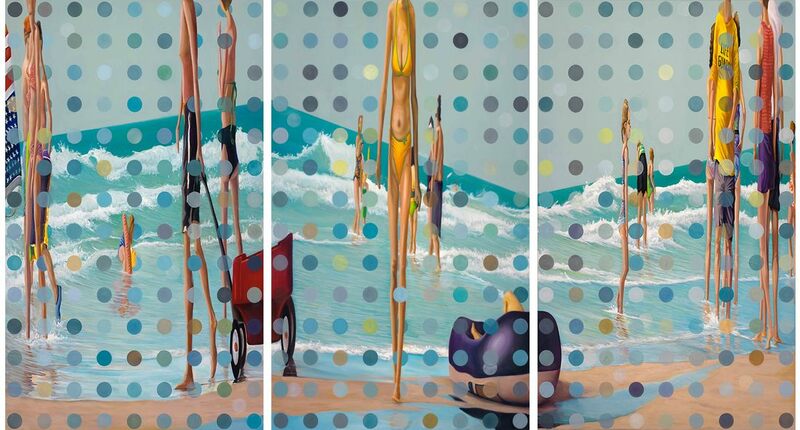 The new painting portray beach scenes with elongated, impossibly thin figures enjoying the beach during everyday moments. "I'm a surrealist at heart," Burlini said. "I wanted to modify that by keeping the root of abstraction with the quality of the moment of reality. Each beach scene has an individual thought, a subtly private conversation." Circles superimposed over the figure draw the eye and create the illusion of movement. "It's like the movement of a wave, or a little interference - a tug of war between the figures and the circles,"he said. "Our eyes are geared to see just so much at a time, and one minute eyes are locked on the figures, and the next on the circles." Although the collection now includes smaller works, the original paintings were over-sized, 10 -to- 12 foot canvases that could be placed individually, or together to create more complex scenes. "When they were towering over you, it was like you were sitting on the beach," Burlini said. The Burlinis introduced the works through an unconventional pop-up gala that began with a "Willy Wonka" challenge. "It was a complete gamble," Burlini said. "I sent out golden tickets with candy bars. People had no idea what to expect. We asked the question,'Are you willing to go on an adventure into the unknown?' "We're humbled and flattered with the response, he continued. "We are creating our own identity in the art world by keeping exclusivity to our work. "A pop-up gala offers people a unique opportunity - a personal involvement in which to experience the artist and his work. There is a welcoming atmosphere of celebration, entertainment, and excitement. 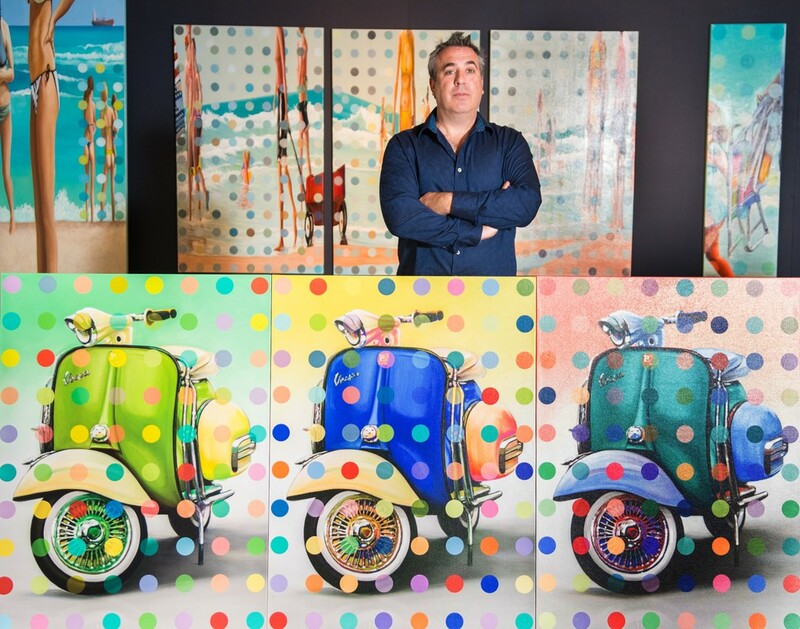 Although, Burlini still woks with galleries and having his own studio has allowed him a larger platform to showcase his work. The art world has changed, today, with the power of social media, artists are taking more responsibility, becoming more business-oriented. It's very rewarding!" It was a night to remember with a red-carpet reception and press photos flashing in downtown Delray Beach on January 13, as nearly 400 artists and art lovers converged on the Cornell Museum of Art and American Culture at Old School Square Cultural Arts Center. The Cornell Museum of Art and American Culture, located in the restored 1913 Delray Elementary building, was dedicated in 1990 as the visual arts center of Old School Square, which also houses the Crest Theatre (c.1925), a 1925 gymnasium and a new outdoor entertainment pavilion. The museum was named in honor of the late Harriet W. and George D. Cornell (the same Cornell University namesakes), who resided in Delray Beach and were the first private donors. Originally slated for demolition in the mid-1980’s, these school buildings were saved and given new life as Delray’s culture center. By successfully combining historic preservation and the arts, Old School Square became the catalyst for a downtown renaissance that would earn national recognition. Students from the Burlini Studio of the Arts in neighboring Boca Raton were celebrating the opening of their group exhibition, complements of nationally recognized Italian-master-trained pop surrealist and instructor, Christopher Burlini. The museum entrance was alive with glamourous pomp and circumstances not unlike the Academy Awards, with a string trio serenading all as they entered the museum. Guests enjoyed wines, liquors and hors d’oeuvres as they contemplated the variety of paintings on display. It was a night of joy and recognition. Art connoisseurs flocked to the first-ever encore lecture series "From the Artist's Perspective" at the Boca Raton Museum of Art to view a video presentation filled with the Dali-esque "Circus and Sound" oil paintings by Christopher Burlini. The whimsical yet dramatically emotional porfolio features a private carnival with a pinging arcade machine, a Warhole-style still life replete with playful artifacts like a pop-up clown box, as well as a red velvet-curtained stage of vividly scaled tropical fish playfully tantalized by a dangling carrot. Please click on the YouTube button to see the movie. Coinciding in the same month as the designated United Nations Holocaust Remembrance Day, a local art studio is presenting a unique and poignant exhibit of original paintings and sculptures, all with Holocaust themes, and inspired by talks given by South Florida Holocaust survivors. 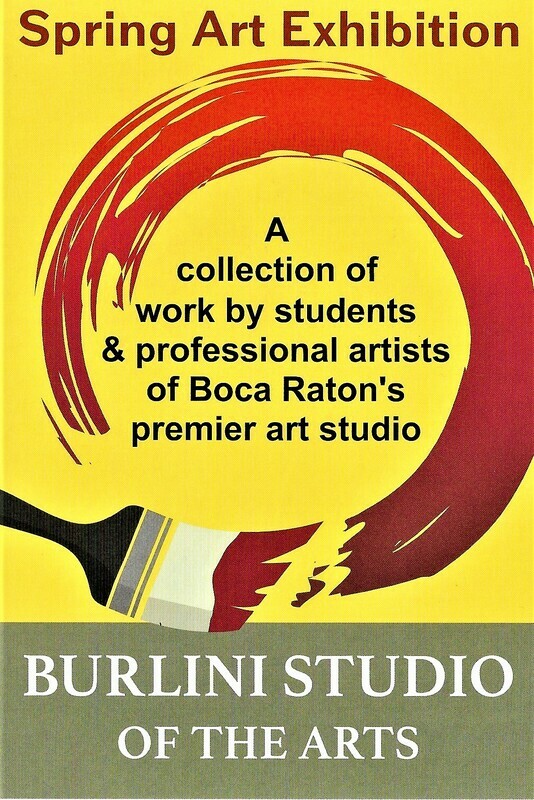 The Burlini Studio of the Arts, 3500 NW Boca Raton Blvd. in Boca Raton, in partnership with NEXT GENERATION'S "GenZ project," is sponsoring "Story Expressions: Pieces of Art," featuring 30 to 40 works by the studio's art students. ​The exhibit kicked off on Jan. 17 with a “Story Expressions Under the Stars” event. Outdoor tents were set up with sitting areas set aside for attendees. The Holocaust survivors, played outside the studio and the art works were displayed in the studio. Several local Holocaust survivors attended the event, which also included a film. “It was a very different art opening,” Chris Burlini, owner and director of the art studio said. ​Sylvia Kahana, executive vice president of NEXT GENERATIONS, and co-chair of the GenZ Project, was one of the art students who had two paintings, “Never Forgotten” and “Release, ‘and a moving sculpture, titled, “Memorial” represented in the exhibit. GenZ Project educates students on the Holocaust and world genocide by connection Holocaust survivors with students through a live workshop. ​The workshop is a formal Lesson Plan, which counts as part of the student’s grade. It’s a project of NEXT GENERAIONS. Chris Burlini said “Story Expressions” came about through the efforts of his students, some of whom were GenZ members, including Kahana. ​ “They were looking for a platform looking to express themselves,” he said. “Art needs that freedom of speech. We wanted this to represent any kind of genocide. Some say 'I wasn't affected by the Holocaust.' The world was affected by the Holocaust." One painting by Ruth Jacobson shows her husband and mother as they waited at the railway station in Poland for the train that would help them escape to China. Holocaust survivor Norman Frajman was one of the survivors who attended the opening. Following its successful run at the art studio, the exhibit has now moved to the Delray Beach Library. MEETING CHUCK CLOSE, UP CLOSE! 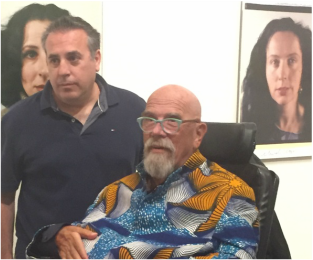 BURLINI with one of his favorite artists - CHUCK CLOSE.